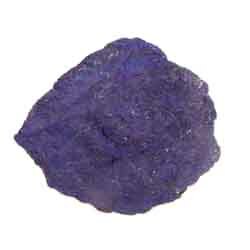 Azurite is a copper carbonate mineral. The chemical formula is Cu3[OH CO3]2 and results from the oxidation of copper sulfides. It is a deep blue color and is very soft. It is 3.5 to 4 on the Mohs hardness scale. The crystals of this mineral can be tabular and prismatic and can be a spectacular deep blue. The crystal form is not common however. It is most frequently seen massive or in nodules. Azurite weathers easily. Light, heat, and open air can all affect the color of this mineral. It reacts with oxygen to form malachite. For collectors care should be taken to keep specimens in a cool dark environment preferably in an air tight container. Azurite is associated with malachite and chalcopyrite. Though it is not a major source of copper it is a good indicator for the presence of copper ores. Large crystals have been found in Tsumeb, Nambia, Touissit, Morocco, Chessy, France, and Guang Dong, China. In the U.S. Bisbee, Arizona is famous for its azurite crystals. The deep color of this mineral has made it a popular pigment. Because all copper minerals are toxic they should not be used in aquariums.